Special applications/finishes: Brush textured finish (slip-resistant), Cover irrigation pipes, drains, etc. Comment: Extending 10x20 covered concrete patio. Extension will run from the porch to within 3 feet of the fence. The extended slab will have a decent amount of room, including enough space for a 12'x16' shed. Comment: I have pulled up the existing concrete pavers and have laid some base material down. I need help finishing the preparation of the area (tamping and adding sand and making sure it is all level) and then laying the new pavers. I can have the pavers delivered, so I really just need a bid on labor. But I am open to a full finish out bid, including the remaining materials. Comment: I need the left side of my home paved at a slight angle so water drains away from the house and into the parking lot in the rear. San Antonio Concrete Contractors are rated 4.79 out of 5 based on 889 reviews of 96 pros. 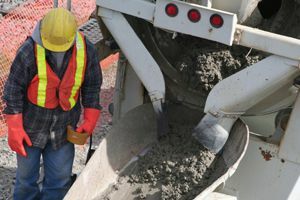 Not Looking for Concrete Contractors in San Antonio, TX?